"On Our Radar" is a monthly 49th Shelf series featuring books with buzz worth sharing. We bring you links to features and reviews about great new books in a multitude of genres from all around the Internet. Despite being thematically heavy, Red Jacket is an accomplished, intelligent novel. It is to be savoured for its multiple layers of meaning and—especially—its richness of language." And don't miss Pamela Mordecai's "Novels of the Caribbean" list from last month. "From a group walk in Glasgow meant to boost mental health, and a pilgrimage in Wales, to a harsh winter trek in northern Quebec, to walking the beat with cops in North Philadelphia and with a letter carrier in Ottawa, to accompanying his children to school, Rubinstein reveals, and revels in, "the transformative powers of walking." ....After a long history of being looked down upon as a low-status activity and means of transportation (hence the negative connotation of the adjective 'pedestrian'), walking is poised for a comeback. The formerly 'radical' ideas pioneered by Jane Jacobs are being embraced under the rubric of 'new urbanism' by big-city mayors, Rubinstein observes, from Bill de Blasio in New York to Calgary’s Naheed Nenshi, and of course, those semi-utopian Scandinavians. (I frequently visit Calgary, my hometown, and Nenshi’s task appears, if not Sisyphean, at least Herculean.)" "In the same vein as George Orwell’s Animal Farm, Fifteen Dogs reveals universal truths about human nature by transferring consciousness and conscience to animals. Alexis masterfully dissects the discrepancies in the way humans think and feel, by posing large questions, such as: What is happiness? And what makes a life truly fulfilled? One by one, the dogs succumb to death in full awareness of their mortality and the demise of their language. But by the story’s end, Alexis makes clear that the virtues of love—of being in love and loved in return—is at the core of a good life." From "Tell Me Medicine Woman, Who Do I Belong To?" Read the whole excerpt, and other poems. "In the past few years, I fell into the mentality that if I was going to cook something, I had to do it the right way, or at least the rightest way possible in a home kitchen. Homemade pasta, homemade bread, homemade pizza. I still want to cook like this, but it's not currently amenable to having a newborn. 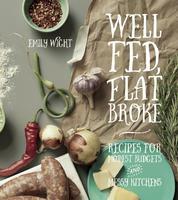 My stash of quick and easy recipes was getting boring, so I started flipping through Well Fed, Flat Broke: Recipes for Modest Budgets and Messy Kitchens by Emily Wight. Wight lives with her husband and toddler in beautiful, but increasingly expensive, Vancouver. She started Well Fed, Flat Broke as a blog to document how she feeds herself and her family in a pricey locale, with a few other constraints—her husband has Type 1 diabetes and her son, typical of most two-year-olds, is picky. Both she and her husband work full time as well, and time is at a premium. So the book was full of the types of recipes I was looking for (relatively easy, inventive, economical) and I've probably cooked more from it than any cookbook in the past few months." "Bach’s years as a high-school ESL teacher help her understand the behaviour and motivations of these young adults, particularly in the novel’s well-paced plot, realistic scenarios, and tone. Paul’s initial resentment and later acceptance of Sofie, as well as Paul’s ex-girlfriend tagging a photo of Sofie on Facebook with the word 'Dyke,' give the novel its authenticity, showing how Bach excels in her honest portrayal of complex, intensely emotional, self-aware characters. She keenly explores the weighty subjects of teen sexuality, meaningful relationships, and self-discovery with respect and sensitivity." "When you live in a city, nature’s successes can feel like impositions. We have too many pigeons. Too many squirrels. Too many sparrows, and roaches, and ants. Too many . . . flowers? Flowers we don’t seem to mind as much but we certainly don’t pay any attention to them. Not if we’re adults, anyway. Kids, on the other hand, pay an exquisite amount of attention to anything on their eye level. Particularly if it’s a spot of tangible beauty available to them for the picking. Picture books have so many functions, but one of them is tapping into the mindset of people below the ages of 9 or 10. A good picture book gets down to a child’s eye level, seeing what they’re seeing, reveling in what they’re reveling in. 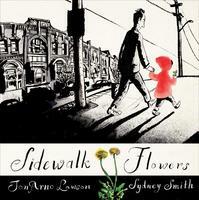 Perspective and subject matter, art and heart, all combine with JonArno Lawson and Sydney Smith’s Sidewalk Flowers. Bright spots of joy and comfort, sometimes it takes a kid to see what anyone else might claim isn’t even there..."